Do you read the labels on sunscreen bottles or just grab and go? Do you understand what UVA and UVB, or Broad-Spectrum means? Learn how to chose a safe sunscreen without harmful ingredients and additives to protect your children’s skin this summer. Every year I buy a ton of sunscreen but there are always a million different brands and types on the shelves to choose from so I know how overwhelming and confusing it can be. What SPF is the best? What does UVB and UVA and broad-spectrum really mean? Do I need waterproof or regular? 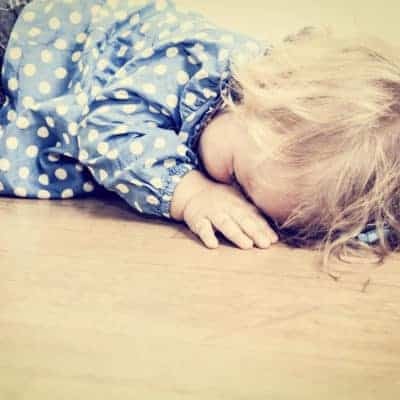 When our son was little, we started noticing he had an allergic reaction to most mainstream, non-mineral based sunscreens and after testing and researching sunscreens, I came across the EWG website which provides a “best of” and “worst of” sunscreen list each year. The EWG is diligent in considering the ingredients and percentages of active and non-active ingredients included in each product. Most of the sunscreens on the list are mineral based which work great for our son’s allergic reaction to the additives found in the huge Banana Boat and Neutrogena creams, but we were more relieved to know we were providing better sun protection and healthier skin choices by finding sunscreen choices in lotions and sticks from the lists they’ve narrowed down for parents, just like you and me. Here is the list of the EWG’s best-scoring and safest sunscreens for children. We’ve tried all of these sunscreens and love them because they work well, are great for our kids who have sensitivities to sunscreen additives and especially the sticks are easy to carry around in my diaper bag and are ready to pull out at any time. Also, here is the list of the EWG’s worst-scoring sunscreens. Sunscreens with ingredients zinc oxide and titanium dioxide rate well with the EWG because they prove to be stable in sunlight, offer a healthy balance of protection from both types of ultraviolet radiation – UVA and UVB – and don’t contain harmful additives like oxybenzone or Vitamin A (retinyl palmitate.) A lot of mineral sunscreens made the list this year due to not having these additives. Quality sunscreen will do double duty – protecting your skin against sunburn, primarily from UVB rays, and also from UVA rays. These UVB and UVA filters will be identified as “broad spectrum” protection on sunscreen bottles. 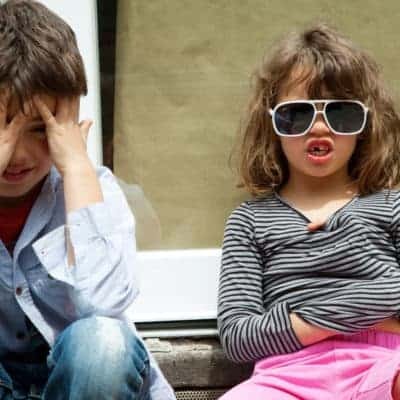 Sunscreen sprays don’t make the EWG top lists because of inhalation risk and while the spray feature is convenient for parents of squirming kids, the spray may not provide enough thick coverage for adequate sun protection. Contain retinyl palmitate, a form of Vitamin A, which has been proven to speed the growth of skin tumors and lesions and can be found in SPF-rated moisturizers and lip balms. Wear clothes to protect you from the sun and shield you from the sun’s harmful UV rays – which can reduce your risk by up to 27%! Pants, long sleeve and short sleeve shirts, hats, sun hats and shorts can all help protect you. Reapply sunscreen every time after you go in the water, but also every 45 – 60 minutes is a must in order to not get sunburnt. Even if your sunscreen says it has a high SPF, which sometimes this number is misleading, still reapply sunscreen often and liberally. Choose a spot that’s shaded – under an umbrella or tree – or make your own shade with a beach tent, or easy-up pop-up tent or canopy. If you’re planning on being outside for a long period of time, bring an easy to assemble tent where you can place it in the shade and let little kids rest or take a nap in the shade and cooler temps. While glasses can be a fashion accessory, it’s more important to make sure they’re still equipped to protect your eyes from harmful UV rays. Make sure they are labeled to protect against both UVA and UVB rays. Don’t head outdoors during peak sun times – from 11am – 2pm – make plans to head outdoors in the early morning or late afternoon/early evening when the sun is lower in the sky and isn’t beating down directly onto any exposed skin! In 2011, the FDA found misleading numbers of advertised protection levels. Inflated SPF values such as some sunscreens state they have an SPF of 70 or even 100 – were found to be misleading and in fact, were found to be significantly less. The FDA has requested a ban of all sunscreens stating they aren’t above SPF 50 because this is the highest level of protection possible. Next, try to find a mineral-based sunscreen with a high SPF level (50 is perfect!) for best coverage with the least amount of harmful additives. 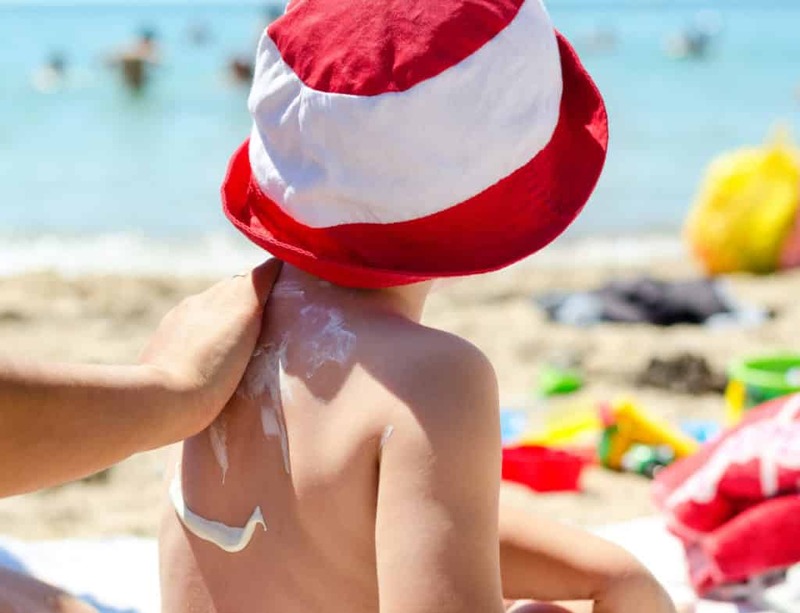 Yes, spray-on sunscreens are easier to spray on little kids that don’t stop moving, but they also pose an inhalation risk and may not provide a thick and even enough coat of protection like cream counterparts and even sun-sticks, may.